Small deli and store... for great soups, generously crafted...Gyros were so good, the meat melt in your mouth. Lettuce, tomato, onion & choice of condiments. Roasted red peppers, lettuce, tomato, onion, cucumbers, & sun dried tomato mayo. Provolone, Swiss, cheddar, pesto & tomato on choice of bread. Thick cut bacon, provolone cheese & tomato on choice of bread. Seasoned w/ cajun or Italian spices, pesto mayo, lettuce, tomato, onion & provolone on choice of bread. Baked ham, American cheese & tomato on choice of bread. Roast beef, cheddar & grilled onions on choice of bread. Smoked turkey, Swiss cheese & tomato on choice of bread. Grilled onions, tomatoes & American cheese on choice of bread. 🍞 black bread imported...frozen ...and herring...hard to find..never had lunch there...looks kinda seedy..and not very clean..but I'm sure locals wouldn't notice.. The Italian piagga sandwich was wonderful. The store carries a lot of things that you can't find anywhere else. Worth a stop to look around! Milda's is the perfect place for great soups, generously crafted sandwiches and traditional Lithuanian fare. A good place for all the little things you meant to bring but forgot - last minute drinks and snacks, etc. 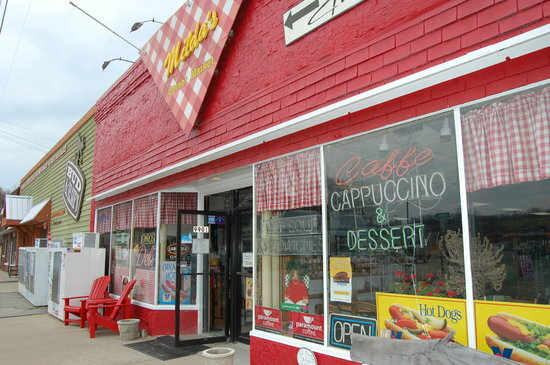 This is a mom n pop corner store not far from the interstate with wonderful Lithuanian food to eat in or take out. Also has some imported jams and stuff from Eastern Europe. Try the bacon buns Milda makes in her kitchen!! Cute Mom & Pop store. Ate lunch and it was fantastic. Gyros were so good, the meat melt in your mouth. Surprised to find Barritt's Ginger Beer soda (from Bermuda) in the small town. Must visit, great experience. Get quick answers from Milda's Corner Market staff and past visitors.